The view from the narrow kitchen window in the house I grew up in was a fairly stark scene, even in the spring when things began to grow green after those long, cold Kansas winters. Looking out while doing dishes, all I could see was a patch of unenthusiastic grass, some scraggly bushes and behind those, assorted dilapidated farm buildings. However, just about this time every year this scene faded into the background when the lilac bushes burst onto center stage, decked out in their finery, singing bright, happy songs, cheering up the whole world. They were giant bushes of white and purple blooms, the branches joining with one another to make an arch under which we could walk. Standing beneath these bushes, breathing in that scent, feeling the small flowers fall down upon my head when a breeze came though, I felt rich beyond belief. These opulent jewels hung heavy and I gathered them in my arms and breathed in their scent. My best friend E and I would sometimes play under the bushes, plucking large blossoms to place behind our ears and laughing at our exotic treasures. Here in our part of California, lilac bushes are hard to find and they struggle, never growing very large. Just a few years ago, I located one. It was in the yard of a house on my regular walking route and one glorious day I saw it had produced beautiful purple flowers. I went up and breathed in, taking all that scent in, and memories rushed back to me. The people who own it must have wondered about the crazy lady who stopped to smell this bush every day. This year the bush seems even smaller than most years and the blooms have not been abundant at all. Their smell is not as strong. I stopped a couple of times, but then started passing by without smelling the blooms. I was in a hurry to finish my walk and there were so many other colorful flowers popping up along my route. Sunday my best friend E, that same one I played with under the lilac bushes, called to tell me that she most likely has a terminal illness that will slowly, painfully, take her life in the next six years. So this is what a hard kick in the stomach feels like. E and I became best friends in first grade and she has been a part of the landscape of my life for the past 44 years. Grade school, high school, college, marriage, children, and the loss of parents—we’ve been through it all together. “It’s only half-time!” I told her when we turned 50 together. And I stop, every single day at the small lilac bush, to touch its less than perfect blossoms, to smell the fading scent, to appreciate the beauty that is still there. This morning I stopped and stood before it, crying at the sight of the few flowers that remain there. I cried because it is rare to find this kind of beauty on life’s route. I cried because I know that it is fleeting. I cried because I know someday it will be gone. Oh, Betty, I'm so, so sorry. As I read this (beautifully written) post, I'm praying for both of you, and praying that you will be able to be strong for your dear friend in the upcoming months. Hugs, dear Betty!! Betty, sending you and your dear friend, lots of hugs and prayers.. Blessings and best wishes always! I send my thoughts to you and your friend. What a beautiful thing you are doing for her by sending her loving energy. I hope those lilacs keep your heart warm and memories alive. I will send my prayers your way as well. I know what it is like to have a friend like that. I don't have many friends, but I do have 2 that I have known for most of my life, and I sometimes wonder what it would be like if they were not in my life. This is my first time reading your blog and I'm so sorry about this. I wish I could say something more. Hold on to those memories. . . and remember that she is not gone yet. There are still memories to be made with her and I know you will....my mom's friend had terminal cancer. They gave her a few weeks to live. She lived more than 5 and we all had some wonderful times together in those five years. You will too. I am so so so sorry to hear about your dear friend. How awful. Thank you for sharing such wonderful memories of your beautiful friend from when you both picked lilacs and enjoyed their blooms. That very fragile lilac tenaciously defying all the odds and growing in that part of your world shows that with a lot of care and love and attention there is always hope. You're doing exactly what she needs, being her friend. I'm so sorry to hear your friend is going through this...sending hugs and prayers for you both. What a great friend E has. You are doing exactly what she needs you to be doing. I shed a tear for you and your friend E today. I'll keep both of you in my thoughts. Oh, Betty, you're making my mascara run! Oh, Betty! I'm in tears. I'm so very sorry to hear this. Very sincere and meaningful post. I am so sorry for your friend, and for you. A 44 year friendship that has weathered the storms of life is a true triumph, worthy of celebrating -- in big and small ways -- every day. And, the lilacs -- what a beautiful analogy to use to describe the fleeting time we have on this earth. I'll think of you & your friend -- and say a prayer -- when I pass the lilac bushes on the dog walking route. Oh my gosh. 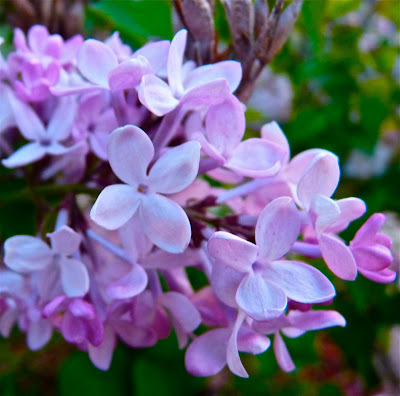 I thought this was going to be a post strictly about lilacs (they're my hubby's favorite scent). Hi, I came over here from Pearl's blog. I'm very sorry for your friend, and for your pain. I grow lilacs, French ones, they're beautiful. Maybe the owners of the lilac bush would allow you to tend it a bit? They get spindly when they're not dead'headed, they don't need much other than that, but I do know that they love ashes. I put the ashes from my fire place on the ground at their feet in the winter time and they bloom profusely in the later spring. I wish your friend a miracle. Oh Betty, I feel a pain in my heart for you. I think I can smell those beautiful lilacs and feel their bittersweet irony. If I were close enough to you here in CA I would offer you a shoulder and a cup of tea. I'm so sorry to hear this sad news. I'll send both of you healing energy and prayers during my walk here. Very cool. Love their smell. SO sorry! Prayers to you and your friend. I'm so sorry for you. What a heartbreaking time. My thoughts and prayers are with you and your friend. Beautiful post, even among the sadness. Dear betty . . . my heart is heavy for the news you received from your dear friend. Something like this is so hard to get a handle on. I am sending energy to her - lots of positive energy. Please know that you both will remain in my thoughts. She is forever a part of you, and now of all of us, for I don't think I will ever look at another lilac bush without thinking of the two of you. Sending you Peace. . . Oh...I'm so so sorry! I will keep you and your friend in my prayers! Beautiful! I love spring and the scent of lilacs. Thanks, Betty! So sorry Betty to hear about your friend. It is so very hard when we are far away from loved friends and they are sick or in trouble. My best friend in Ireland recently lost her father and I found it so hard to be stuck here, 5,000 miles away not able to give her a hug, or take her out for a few drinks and a chat. I hope you share this wonderful post with your friend - I think it will let her know just how you feel. Oh Betty I'm so very sorry to read about E....it breaks my heart for you. Your walks dedicated to her are a beautiful tribute. Several years ago a dear friend of mine died unexpectedly. She was a avid knitter. She donated all her knitting to the new born nursery at the hospital. Since her passing, I've tried to fill her void there by crocheting baby hats for the premmie nursery. I'll never be able to contribute as much as she did but I know she would be happy. So sorry little sister! I remember the lilacs being a bright spot too! Feeling your sadness and wishing you hope. I will smell my lilacs when they bloom and think of your friend and of you...stay strong for her. I read your post today and was saddened to hear about your friend. You both are in my prayers. Your post today was so beatiful. With your beautiful writing, you keep your friend E. alive and well. This post made me cry! Sending hugs and prayers! Your post was so sad and yet so beautifully written. I am so sorry Betty. Sending you and your dear friend thoughts, hugs and extra prayers. P.S. I love your header photo! It's PERFECT! P.S. You write beautifully! Such wonderful description...~J. I love lilac bushes and love their scent. Btw do you have Swiss roots, Betty Bossi? i'm praying but I wanted to tell you that your photography is breath-taking. I am a huge fan of anything purple, but I must admit the scent of lilacs is not my favorite. This was so touching and beautiful. I'm so sorry for you and your friend. Oh Betty, my heart hurts for you!! You and E are in my prayers. This post was a beautiful tribute to your friendship. I absolutely can't wait for lilacs each year, and now I will always think of you and E and friendship when I smell them!! Thanks for sharing your heart with us!! Betty, I am so sorry about your dear friend, E. Curses to the disease that threatens her life. This life is but a vapor, isn't it? I don't think there is any better way to honor E, than to cherish each moment. Beautiful post. Sending you love and prayers for your friend. I lost one of my closest friends to cancer 7 years ago, I miss her so much and think about her every day. Life is so precious, and fleeting, we do need to remember that. Thank you for sharing. Hugs. Oh, Betty, I feel so badly for you. But what a beautiful post this is. I'll keep you in my thoughts. Incredible, the things we are suddenly awake to. I do not envy your insights -- such pain. I will dedicate my next few yoga practices to you and E (I go daily). Know that somewhere a woman in Minneapolis will be concentrating on the two of you and wishing for the best. You and your friend are in our prayers Betty, I know it's hard being that far away but you are being the best friend you can be by keeping in touch right when she needs you the most, I know she appreciates that and the memories you have shared and the ones remembered by smelling the Lilacs can never be taken away. You and E are in my thoughts and prayers too. Thanks for this beautiful piece that has moved me to teary eyes too. What a sweet blessing you are to your beloved friend. I will lift you and your friend up in my prayers! and i cried because i know you, and i grieve with you, and for the lilacs i have lost, and will lose, and those who someday i hope i know. I'm sorry I wasn't around yesterday to share your sadness. I am so very sorry. Sorry for your friend. Sorry for you. And she is feeling your love, I am so sure of it. Friends like that are rare jewels, beautiful sprays of lilacs which there is nothing, nothing more heady and lovely in the world than a lilac. I, too, have the memories of lilacs from my youth. I'm not trying to be preachy in any way, but I think the best thing you can do for your friend besides be there is to live. Take a moment to be sad but then live. Live for her. Live for you. Find joy in the small things like you do. Take care of yourself. Smile. Laugh. Love. For both of you. There just aren't ever the right words to soothe a hurting heart.... but somewhere in the midst of it all, there is a comfort that can be found in knowing that you are incredibly loved and supported and thought about and prayed for all over the states!!! People who don't even know you, but get a small glimpse into your life by the words you write and share with us.... you move us, Betty. You make us, laugh, and yes, you can even make us cry. I am praying for E, and I'm praying for E's family, and I'm praying for you and for everyone else who know and love E.
My goodness, Betty. I am so sorry that you and your friend are dealing with this. Life is so very fragile and so very, very precious. Sending you prayers and lots of positive energy. I am so terribly sorry to hear this news. I know you will appreciate your friend and her beauty while you have her. This is a beautiful post, and a touching tribute to your friend. I hope it gives her strength as she battles her illness. I'm sorry for you to get terrible news, and I'm sure the distance just compounds the helplessness. That's awful news. My heart goes out to you and your friend. BB my heart aches for you. Your post brought me to tears. Prayers for you and your friend - lots of love to you. I think it's an awesome thing you do with your walks. I believe in the power of sending positive energy. Betty, I am so sorry to hear about your friend. My thoughts and prayers will be with both of you. My yard is filled with lilacs right now and I would send each and every bloom to you if I could. Each time I see them I will think of you and E.
Betty, I am so sad for you and your friend. Six years can seem like nothing, but it will be everything. I am sending you both lots of love and hope for an extended lilac season. I am crying here. In Kansas. My college mate is in Vegas, fighting a pancreatic cancer that has spread to her liver. She's been fighting for 2 years. And for 2 years, I have been sitting here in Kansas feeling helpless. Yes, sending love and hope is about all you can do. And care packages filled with silly things that I hope can make her smile. I don't talk much about my friend on my blog, because it is her story to tell and I need to respect her privacy. But all too often, her story is that invisible thread that has weaved its way in anyway. It is hard to be silent when my heart hurts like this. Oh Betty, what a lovely post. I must move you into my sidebar so I don't miss your lovely writing. After I send a big hug your way.